Special guests for the trip include acclaimed Sommeliers Mark Davidson and Scott Oliver. Our team of culinary superstars will be creating eclectic menus for every evening of the trip at each of the lodge, with appearances throughout the weekend by Chef Hawksworth. Cookery classes, demonstrations and wine tastings will take place throughout the week. In addition, a host of outdoor adventures will be offered, to explore the pristine and visually stunning wilderness environment surrounding the lodges, including remote beach lunches, helicopter trips, hikes, fishing and on-the-water adventures. This truly is a once-in-a-lifetime experience to witness the wonder of one of the world’s last true wildernesses, while in the comfort of luxurious accommodation and the company of Canada’s most acclaimed culinary masters. Only limited spaces remain at a cost of $6,500 per person, which includes accommodation, all meals, transfers from YVR South Terminal, fishing equipment with an experienced guide, cooking demos and all activities. 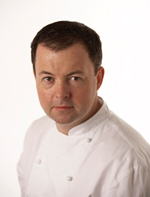 David Hawksworth emerged as one of Canada’s leading culinary talents during his seven-year tenure as Executive Chef of Vancouver’s West restaurant. Upon launching the restaurant in 2000, after spending 10 years abroad honing his talents in Europe at such esteemed Michelin-starred restaurants as Le Manoir aux Qaut’ Saisons, L’Escargot and The Square, critics immediately recognised the depth of his technical skills and innate ability to conjure inspired combinations. With Hawksworth at the helm West became perennial winner at the Vancouver Magazine Restaurant Awards and went on to attract garner high praise from defining publications such as Food Arts, Bon Apetit, Wine Spectator and Food & Wine magazine. In 2005 Hawksworth was named Vancouver’s Chef of the Year and in 2008 he became the youngest chef inductee in to the BC Restaurant Hall of Fame. 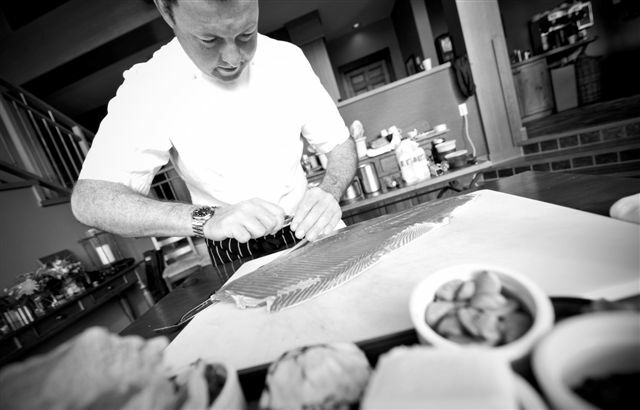 Hawksworth has travelled extensively as a guest chef, most notably at the Masters of Food & Wine, in Carmel and the James Beard House, in New York City. Hawksworth sits on the board of the Chefs Table Society of British Columbia and donates his time to a number of other charitable causes including the annual Chefs for Life culinary extravaganza. Hawksworth is poised to open his eponymous and eagerly anticipated restaurant at Vancouver’s newly renovated Rosewood Hotel Georgia on May 7th, 2011. Dino Renaerts has firmly established himself as one of the west coast’s culinary leaders. Born, raised, educated and trained in Vancouver, the chef and sommelier has built a prolific career spanning over two decades that has seen him cook in a clutch of the city’s finest restaurants, such as Diva, West and Bistro Pastis. An alumni of the Dubrulle French Culinary Institute and the London Wine & Spirit School, Renaerts is dedicated to British Columbia’s culinary scene. He is an active board member with the Chef’s Table Society of BC and the BC Hospitality Foundation and is a partner in the Bon Vivant Consulting Group alongside his wife, restaurant-industry veteran Nessa van Bergen. Recognition for his distinct, innovative approach to cooking has followed Renaerts throughout his career. His talent and passion have garnered him numerous regional and international awards, including accolades from the Vancouver Playhouse International Wine Festival, the Vancouver Magazine Restaurant Awards and enRoute magazine. Born in London, raised in Sydney Mark has been a Canadian resident since 1985. He has over twenty five years experience in the hotel and restaurant business, fifteen of those as a Sommelier. In 1990 Mark was named Best French Wine and Spirit Sommelier in British Columbia and went on to place 3rd in the Canadian finals. 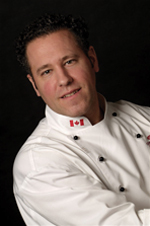 In 2001 he was named Sommelier of the Year by the British Columbia Restaurant and Food Service Association. As a Department Head and instructor with the International Sommelier Guild he is instrumental in the ongoing development of the curriculum and has taught classes in Vancouver, Seattle, Portland, San Francisco, Los Angeles, San Diego and Las Vegas. Mark is currently the Market Development Manager for Wine Australia USA conducting education seminars for Sommeliers, retailers and distributors. In addition he writes articles for Wine Access and Western Living, does weekly radio wine reviews in Vancouver and developed a wine education and restaurant etiquette course for SFU Global Asset and Wealth Management MBA program. Mark has a cheeky teenage daughter which has recently reconfirmed a long held belief of his, wine every day is a must. 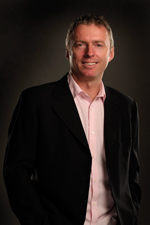 Scott Oliver has 20 years of experience in the international wine business.Originally from Australia he has held senior marketing, sales and general management roles with several prestigious wine companies. Working in Australia, New Zealand, Europe, Asia and North America has given him a strong perspective of global wine trends and styles. Scott has several years of international wine judging to his credit and is equally as passionate about fly-fishing as he is navigating his way through the world of wine. 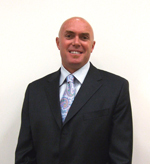 Scott is the newly appointed COO of Select Wine Merchants Canada. Select Wine Merchants represent Piper and Charles Heidsieck Champagnes and wines such as Concha Y Toro, Rothschild, Hugel & Fils, Sebastiani, Petaluma, St. Hallett and Jaboulet in the Canadian marketplace.